You were warned and this is still a work in progress, but here are my 2015 fitness goals – the story so far! runbritain is a website where you can enter races, get training advice, read other running blogs and claim your own personal ranking and handicap – and it’s free to register. Their mission statement is “to make British road running the best in the world in terms of organisation, development and performance”. Once you register, the results from any officiated races are automatically attributed to your profile (or if not, you can usually manually input them), and this includes parkruns. Here’s a graph showing my progress since I joined up towards the end of 2010. You can very clearly see the downward slope in 2012! 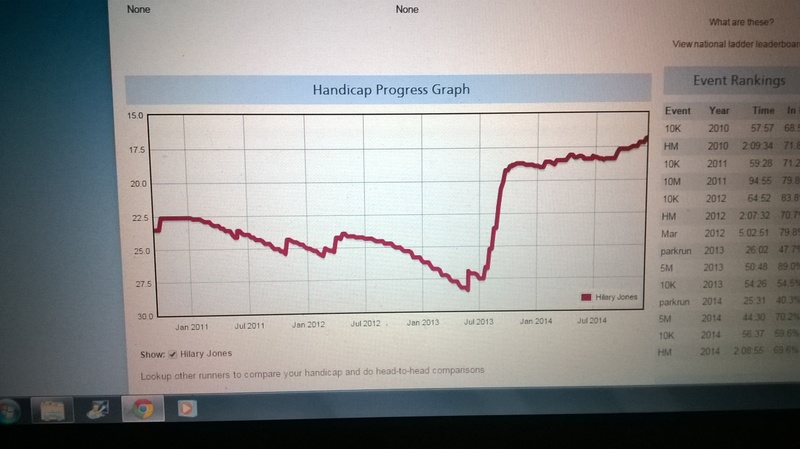 And then the upward slope which coincides with my improved fitness and the start of my parkrun “journey”. It’s obviously flattened out a little bit since my speeds initially improved so although the jump from 16.8 to 15 doesn’t appear that challenging, I think it may be a bit hard to get there. But if I succeed too quickly, I’ll obviously “review the situation”! I think I have accepted that a sub 2 hour half marathon may be beyond me, I wont give up entirely but my goal for this year is to get the new PB so 2 hours 3 minutes and 32 seconds is the goal! At the moment I only have the Paddock Wood half in my diary but I’m hoping that I’ll get another go at either the Great North or the Royal Parks. Especially important as I get older! I’m not quite sure how I plan to measure this but hopefully my continued attendance at Samadhi Yoga classes will help. I’ve decided to use my turtle performance as a guide. And this is what I’m aiming for!! To be honest, this would be good! This year’s goal was to run 800 miles and it would be easy to just increase the distance again – yes, I know that’s exactly what I have done! But this year, they have to be “meaningful” miles. A few weeks’ ago as I drove to the gym to use the treadmill, it occurred to me that all I was doing was turning up to run in order to tick off a few more miles. So this year, I have decreed that in line with lots of training programmes I’ve seen in running media, I shall do a long run, a hill run, a speed run (no doubt that’s going to be parkrun) and because I’ve committed to doing 4 runs a week during January through Jantastic, another run. No doubt that’s going to be the “make up the mileage” run! Can’t believe I nearly forgot this one! Yes, new parkrun PB so that means sub 25′ 16″ so let’s make it challenging and say a sub 25 minute parkrun! Might be regretting that this time next year but I have to give it a try. So those are my five “fitness” related goals for 2015. I shall carry over the resistance/strength related ones from 2014 in the hope that I can improve upon my achievements in those regards. Now back to the drawing board for more personal goals …. Ahead of Sunday’s Sports Personality of the Year – and I hope you’re all going to vote for me 😉 Actually, I hope you’re all going to vote for Jo Pavey! But I digress – again! As I was saying, ahead of Sunday’s Sports Personality of the Year, I thought now would be an appropriate moment to review the fitness goals I set myself for 2014 (and to give thought to some meaningful goals for 2015). So here goes, the end of year review! Oooh, it’s like being back at school! Run a sub 2 hour half marathon – hmm, well okay, that one’s going to be carried forward to 2015 although based on this year’s performances I’m thinking maybe I should amend this to getting a new half marathon PB (2 hours 3 minutes 33 seconds). I have to be realistic. Although the training went well, the two runs I took part in, not so good! Even though I managed to pace myself better in the second run, I still didn’t do as well in a race environment as I do when running on my own. Run a sub 26 minute 5k – yeah, did that back in April and have done it on five further occasions since. And yes, all at parkrun! Although over the last couple of months my times have slowed down a bit so work needs to be done on that front to maintain the benchmark. Be a parkrun tourist – yes, once, where I ran faster than at my “home” run. As outlined in my last blog, points are keeping me at Shorne for the time being but come April I shall spread my wings a little further. I’ll certainly be going back to Great Lines where I achieved my 5k PB to see if I can do any better. Perform 15 full press ups – may seem strange for a personal trainer to say that but my running means I neglect my strength and resistance work. There may also be a bit of I’d never tried so I didn’t know whether I could do it. I’d just assumed I’d fall flat on my face. So back in September I tried it for the first time, and guess what, although it was a set of 7 reps followed by another 5 and then another 3, I did it! And then by the end of the month I managed 15 in a row. I’m attributing this success to all the Downward Facing Dogs at yoga, they’re killers. I’m beginning to hate Sun Salutations! Admittedly, my press up technique probably needs a lot of work but it just goes to show, if you don’t try you’ll never know whether you could. And that applies to all aspects of life, not just press ups! Increase my resistance/weights sessions to twice a week – okay, another fail. It’s probably once a week at best but I’ll strive to improve during 2015. 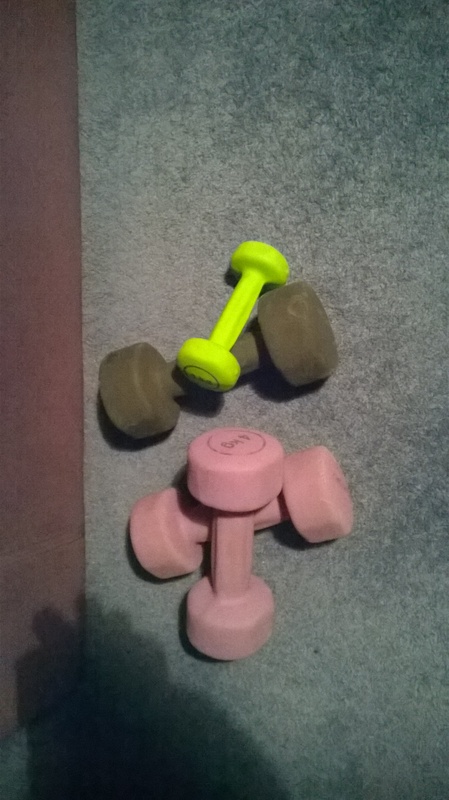 It’s not like I don’t have the equipment to do it – I’m staring at a pile of dumbbells as I type this! 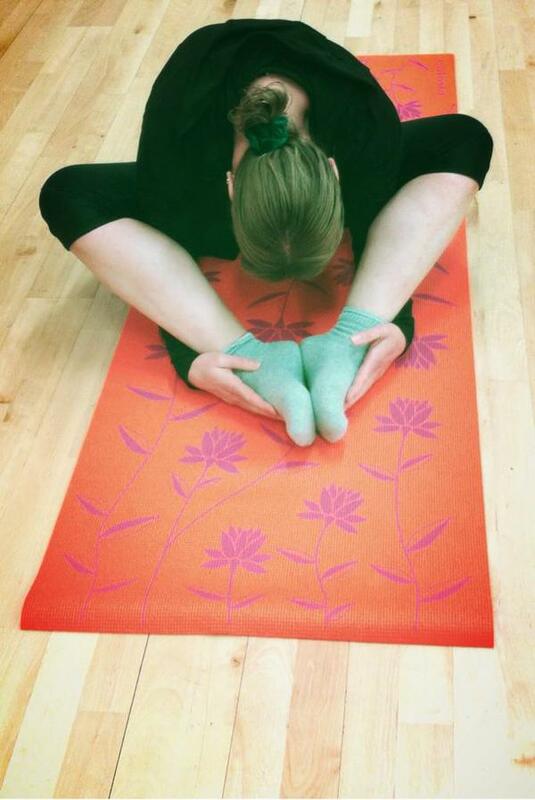 Practice yoga once a week. Well this is a success but it’s not the session in front of the TV with a DVD I’d envisaged. I’ve actually started attending a local class on a where possible once a week basis. This is so much more effective. The classes with Samadhi Yoga are themed around different aspects of life/chakras and the only shame is that the “loving thoughts, loving words, loving deeds” homily at the close of class lasts until we get to the car park, or maybe if we’re lucky to the roundabout! Nothing about our fellow class mates of course, more about some other niggle from everyday life but at least the class lets us focus on ourselves for an hour. Perform a plank for more than 60 seconds. Another shameful admission from a personal trainer but again, if you don’t practice or try you don’t know whether you can do it. Plank has not been part of my regime for many a year but I’ve managed it once in a gym environment this year and a few times during ballet jam classes, where it would be too shameful to collapse before the time is up. And having proved to myself that I can do it, have I tried again – nope! During the year I’ve read suggestions that doing several shorter timed planks is actually more effective than one longer one. I shall try adopting that practice to see what I think. Another of my fitness goals was to improve core strength but I’m not totally sure how I was supposed to measure that particular goal! There is thinking that performing a plank for more than 40 seconds is a sign of core strength so maybe that’s what I should use as my measure. Just goes to show you should always aim for goals that are SMART – specific, measurable, agreed, realistic and timed – with the emphasis in this case on “measurable”! Increase muscle mass – well this can only be measured by what my scales tell me. A quick assessment this morning proved I have, marginally, but that needs to be enhanced hopefully through more resistance work and a few tweaks to the bad habits which have crept into my diet. Less cake more carrots! The other goal I had was to run 800 miles this year, an increase over last year’s 700. At the current point in time I have 19 miles left to run and hopefully ample time in which to do it, assuming we don’t get snowed in between now and the end of the year. So some successes and some failures and whereas 2013 was the year I worked on getting back my fitness after 2012’s anaemia, 2014 was the year of cementing that progress and I think, on the whole, I’ve managed to achieve that. Next year’s targets need some serious consideration so I shall get the thinking cap on and elaborate on what I’ve come up with in a forthcoming blog post! You have been warned! Several months ago I was chatting with a fellow parkrunner and she told me how she’d struggled to turn up on a Saturday morning since she’d achieved her 50th run. She said the 100 seemed such a long way away. At the time I was still a few short of my 50th and couldn’t quite sympathise with her sentiment. But, boy, now I do! Since completing my own 50th run back in October there have been a couple of times when I’ve really struggled to get out of bed and turn up to parkrun, in fact on two occasions I have failed! Once, admittedly, was down to work. A client had asked if I could do any earlier than her usual 1pm appointment. Normally, parkrun is sacrosanct and I’d have reluctantly said no. As I was pretty confident that this was not likely to become a regular thing, on this occasion I proffered a 9.30am appointment meaning parkrun would be sacrificed for money. Well Christmas presents have to be paid for somehow! The moment she said yes, a sense of relief came over me. I’d still have to be up at a reasonable hour but on this Saturday morning, it wouldn’t be me doing all the hard work! The second occasion was after two very poor nights’ sleep when the thought of trying to summon up the energy to run at any speed was too much. So the alarm got turned off during the course of my failed attempts at slumber and the duvet got pulled back firmly over my head. I have to ask myself if either of these occasions had been pre-50, would I have so easily foregone my Saturday morning addiction? This weekend, I came up with a cunning plan to ensure my attendance. I tweeted a picture of the sun coming up over my parkrun venue (from my bedroom window – yes, I am that close), and made sure Shorne was “mentioned” in the tweet so I couldn’t back out of running. It worked though. I turned up, I ran and I felt good afterwards. So what am I going to do about this reluctance going forward into the winter months? Well, as with all “goals”, I have to break it down into more manageable chunks. The first is to aim for my 60th run, six to go which means I should crack that by early 2015. Then, do I go for 70 or 75? 75 is going to take three months at best so perhaps I’ll go for 70 and then 75! We shall see. There is one other thing that’s going to get me there and I now have to make my shaming confession! There are not too many people I’ve gone public to with this but the other thing that gets me out of bed early on a Saturday morning is the points table! There, I’ve said it! I am a parkrun pointsaholic. To the uninitiated, each parkrun has a male and female points table which is based on your finishing position in each run, first finisher gets 100 points and second gets 99, etc. 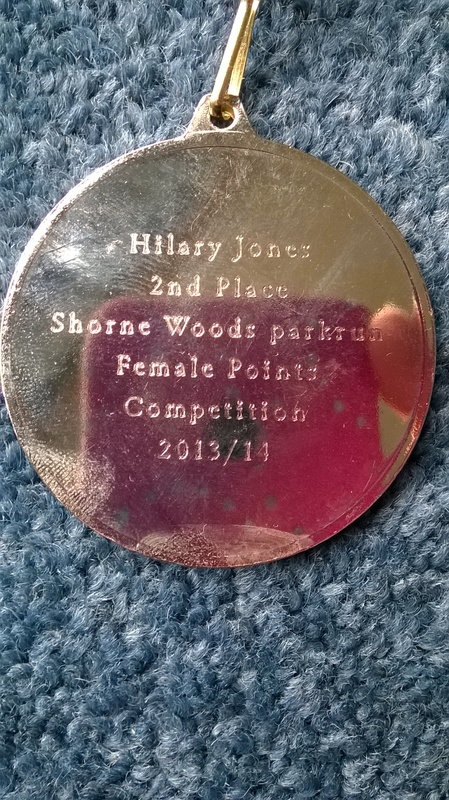 Now last year I came second overall at Shorne Woods and I readily acknowledge that this was down to my attendance rather than my talent at running, added to which Shorne was a new parkrun and I started running three months into its existence. I have a bit of a thing with my age, so coming second was recognition “despite” my age. When this year’s competition started, I had no expectations to be anywhere near the top, there were much faster female runners turning up on a regular basis now. So when I found myself near the top of the table again, even first for a few weeks, that little niggle started again! Can I retain my crown for a second year (despite my age)? Am I doing it for those in their 50s or am I trying to prove something to myself!? I’m currently second and there are still four months to go. Is this going to be too long to keep me in the top three? Will illness, injury, snow or laziness jeopardize my chances? Time will tell but I am going to give it a go, aren’t I?! You might ask yourself why I feel the need to “fess up” to being driven by the points’ table. Well, parkrun is supposed to be non competitive. But then again, if it is, why is there a points’ table? Hence it seems a bit unsportsmanlike to admit to being motivated by the competition. So why do I feel able to reveal this trait now? Recently, when volunteering at Gravesend’s junior parkrun, I overheard another parkrunner confess that although she loved the course and missed the runners, she was reluctant to run at Shorne any time soon because she was now first in the points table at her new more local parkrun. See, it’s not just me. I was so pleased to hear that, makes me feel a little bit better to not being the only one thinking along those lines! One other thing that’s hopefully going to keep me going is Jantastic 2015. I’ve signed up again and committed to four runs a week during the first month and I’m sure this will keep me motivated throughout January, February and March. I highly recommend it and if you’ve not partaken before, details can be found here. This year it’s also been extended to include swimming and cycling too.